1) I give a middle finger to the state government’s treatment of International Students. They pay full fare for transport. I refuse to pay $97 a month for a Zone 1 monthly ticket. How am I different from local students? 2) My mountain bike is an expensive toy, and leaving it at home serves me no purpose. Might as well use it. 3) I am tired of fare evading. Sitting next to a ticket validator, trying to stay awake to catch a Metlink inspector boarding the tram or travelling with this fear in my head is simply not worth it. I am better off paying $97 a month. But I refuse to treated like a second class citizen. Read 1). The long 6 month wait is over and footy is finally here. Currently, Neil is in 6 footy tipping competitions. You think traffic is bad now? Footy traffic + swimming traffic + flower show traffic + Critical Mass = Don’t even think about driving near the city. Friday night drinking has become exciting again. Not only is this a rematch of last year’s Grand Final but how will West Coast fare with the Ben Cousins controversy. Punters have their money on Sydney to win. The exact opposite of watching footy. The finals of swimming are this weekend. ’twas at Joe’s Garage. Was fun. Was all Sunday afternoon. The others had various reports: best cafes, meetup (photo! ), grub eating, live blogging. 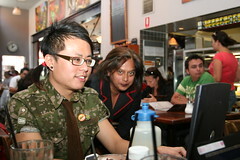 John helps a lady find sarees on Brunswick St! This currently only applies to international flights (or flights through the international terminal, via an international aircraft). They are in effect from 31 March 2007. Each container of liquids, aerosols or gels in carry-on cannot exceed 100ml. All containers must be sealed, in a transparent one-litre plastic bag (sandwich ziplock style or larger, from the picture). You are only allowed one plastic bag. Prescription medicines, baby products, and required non-prescription medication is permitted, but proof of need may be required. They mention that once you hit a screening point, you’ll have to surrender even duty free. Of course, you can purchase it after the screening point (be weary if visiting the US, Canada, Europe), and if you’re bringing it in from overseas they have some guidelines on how it needs to be sealed. Beware if you’re a transit passenger. They can also now randomly frisk you, if required. This is in addition to screening you for explosives. Pack your liquids into check-in luggage if you must. Read the FAQ for more information. Yarra trams has added a new Siemens Combino Plus tram which according to the company improves accessibility, comfort and safety. On the comfort side, it adds more space, better ventilation, better ride stabilisation, and larger screens for stop information. Catch it on Route 16 from Melbourne University to St.Kilda. Fill out the survey on the Siemens site and receive a free key ring. The W11 Karachi to Melbourne tram was commissioned during t he Commonwealth games last year. It’s colourful decoration is based on the W11 buses that are found in Karachi, Pakistan. If you walked around on Friday nights, you would have spotted this very bright tram. It was given a special run on the City Circle route between November and ending last week. The W11’s future is uncertain for now but I would guess that it will turn up again in the future. A video of the W11 tram from a couple of weeks ago. Noticed today that Lamb’s on Commerical Road, South Yarra is all boarded up. A group of lads filled a skip with bricks two skips from the drycleaners. No more delicious late night souvas to soak up all that drink or give you that extra boost before you pass out on some flat, preferably soft surface. Mind you, in my old age – I’ve found that consuming a full souva at 3am a little too much. I know, I know, protein and carbs – not the most balanced meal – but in the early hours the salad just doesn’t do it for me….. Seems to be a bit of action on Chapel ole Windsor way. Building opposite Husk (?) cafe – I’m an Orange gal – is up for lease. Think it’s zoned for retail…….Mulatto has a strong following. Looks like Prahan/Windsor is up for a makeover. Fingers crossed the amazing shoe man, that all good Melbournian gals who love their shoes swear by, doesn’t get booted out! Posted in Cafe, Food, Living in Melbourne, Metroblogging | Comments Off on Where’s my little lamb? As today is a gloomy looking day, I thought this eery looking picture would be appropriate. You know what I was thinking of the entire time I was reading this article from The Age? Everyone is so bloody concerned with the welfare of the daugther/female athelete; what if the roles were reversed and the athelete is a son/male and the coach is the mother? Would Channel Nine and the rest of the Australian media have given a toss? While walking to the Docklands a couple of weeks ago, I noticed a ship that stood out among the expensive yachts usually docked at Victoria Harbour. The Robert Hunter which is part of Sea Shepherd’s fleet is docked in order to give tours and bring attention to Sea Shepherd’s mission. 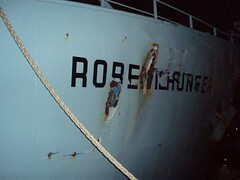 If you remember a couple months ago, the Robert Hunter was physically trying to prevent Japanese whaling ships from performing “scientific research” (killing 508 whales) . This involved launching smoke canisters, chemicals, and nets to entangle propellers as well as the usual ramming of the boat. As you can tell by the picture, the gashes in the ship are quite big and according to a worker it needs to be put into a dry dock and repaired. Agree or disagree with the tactics, historically, it seems like an interesting ship to check out. across from the Telstra Dome. neomien has been kicking round the city, dealing with life offline. Not much of an excuse, but you know how it goes. One of the most wonderful things about melbourne is the food glorious food. The Melbourne Food and Wine Festival is coming to a close, replete with well satisfied swollen bellies and tastebuds tantalised. An aunt of mine was in town recently and I took her on a mini tour of my favorite spots, eating and drinking that is. Yes, I’m a bit of a f**die – I suspect most of us are…..it’s a melbourne thing. We’re spoilt for choice, so spoilt. And the beauty of it is that it doesn’t matter what your budget is, you’re bound to find something delish to suit……and no, fastfood does NOT count…….unless you count a quick fresh soft shelled crab hand roll from Kenzan @ GPO or a reviving lamb souv dripping with garlic sauce in the early hours from Stalactites. In my next couple of posts I’m going to reveal a few of my favs for all occasions……I’d love for you to share your favs with me too……cause there’s nothing I love more than finding a new haunt. ps. The above pic is taken from the kitchen table of ole skool establishment Pelligrini’s Espresso Bar, home of killer coffee – the good stuff and pasta just like nonna makes.